Diesel engines do not require the ignition tune-ups and major repairs of gasoline engines, but they do require regular, low-cost maintenance. Luckily, most diesels are designed for easy do-it-yourself maintenance without investing too much time or money. Here is a maintenance guide for your diesel. 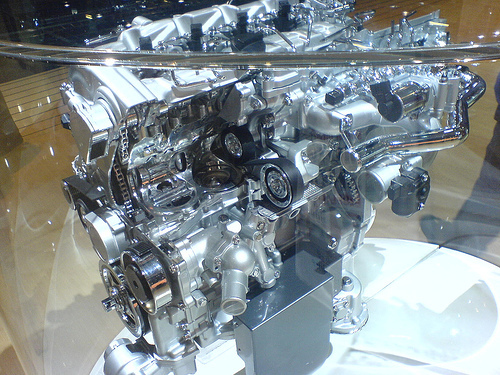 Diesel engines run much hotter than gasoline engines because diesel fuel requires much more heat to ignite. If your diesel overheats, it could be the end of your engine, so cooling system maintenance is crucial. Always make sure you are topped up on coolant and do not ignore the early-warning systems on the dash. If your vehicle overheats, stop it immediately and consult a professional. Diesel engines also use a lot of air to keep them cool. Clean or replace your air filter frequently to maintain steady air flow. Diesel fuel contains a number of contaminants and acidic components that wear on your engine. Filters and additives capture these particles and keep them from gumming up the works. Replace your oil and fuel filters regularly. Many diesels have to fuel filters, so be aware to check them both. Diesel engines shake a lot, which may knock things loose. Check all mounting bolts to make sure nothing has become dislodged, and make sure your gaskets have not sprung leaks. Synthetic oil maintains its viscosity at the high temperatures of a diesel engine where conventional oil often breaks down. AMSOIL synthetic oil also contains alkaline additives that neutralize the acidic components of diesel fuel. For your diesel, synthetic oil better protects your engine and improves performance. Your local AMSOIL dealer in Tumwater, WA, Stokes Abode, can answer any maintenance questions you have about your diesel car, truck, or boat. We offer the best AMSOIL products to fulfill your lubrication, filtration, and additive needs. Give us a call at (253) 381-1550 or shop online at our website.